Hooch is such a sweet dog. He's very endearing, the puppies crawl all over him, steal his bone, etc. and it doesn't bother him at all. He was abused by children who threw firecrackers at him, but he doesn't seem to hold it against people. He also has some buckshot in his hind end, the poor thing. He is noise sensitive because of his abuse, but is not aggressive at all. He is as gentle as they come and we want to make sure he gets the best home ever from here on out. Rebel is a 10 month old male retriever mix with many features of a Golden, except he has shorter hair. He was living with his pal, Dolly, in a foster home in TN and had taken to escaping and going on daily adventures because the yard was not secure, so we rescued them before they got hit by cars. Rebel is an awesome dog and everyone's favorite. He is affectionate and very smart. He is really focused on people and craves the leadership that he deserves. 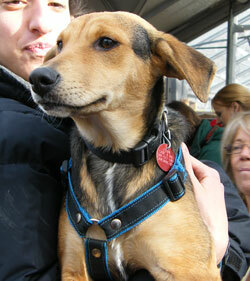 Bentley is an adorable 4.5 month old Beagle/Lab Heinz 57 mix. He is has the body of an English lab and coloring too but is smaller and compact and we know his siblings have some beagle. He is just as cute and playful as can be, even though his pictures look serious (he's not). He is part of a litter of nine pups. He is the sibling to Beamer and Shasta. He is friendly and easy going. 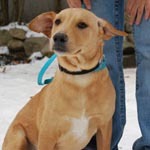 Cookie is a 3.5 year old female Retriever mix. We placed her sister Molly a few weeks ago, so now we are bringing up the litter mates. Cookie is a nice dog and the perfect size to take on hikes, ride in a car, or just go walking with. 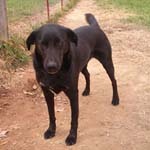 She's very labby looking, but is smaller so is easy to scoop up in your arms if you need to pick her up. She has a short tail, probably from her Aussie heritage. It is a naturally bobbed tail, but longer than an Australian Shepherd. She's somewhat timid until she gets to know you. She was the dog of a single woman and would be great if she found another single, or a couple with some patience. She has been an outside dog, but will make the adjustment of home life, just like Molly did, once someone gives her a chance. 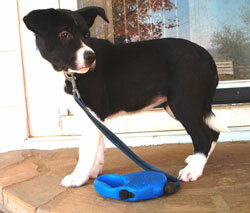 Ali is one of three Border Collie mix pups who are coming up on December 7th and will be available around the 9th. They were rescued at six weeks and have been in a foster home in TN. They are cute and playful and well adjusted, well socialized puppies as far as we can tell. They are too young to be left alone all day so a person with flex hours or part time hours is preferred. They are up to date on vaccines, wormed and flea free. They are fine with cats, good with other dogs...can be a little timid at first, but they are now with Morgan and Sunshine and play fine. Beamer is a 4 months old Lab/Beagle mix, but only a touch of beagle and he doesn't act houndy at all. He may have some collie as he has wavy fur and a white blaze on his nose. He is a sweetheart of a dog, so gentle and submissive. He is a couch potato at night, as you can see from the picture. 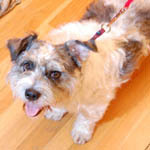 He is being fostered in W. Roxbury and he can be seen once we receive your application. 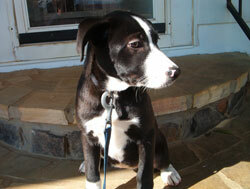 His foster mom writes: Beamer is a sweet, cuddly puppy. He will sit on your lap, on the couch, or on the floor at your feet, and rest quietly for hours. He is fully crate trained, and can stay in there overnight without any accidents. 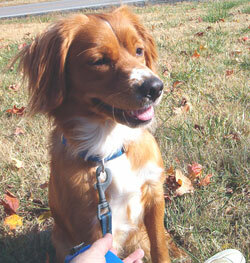 However, he still needs a reminder to “go” outside, so frequent visits outside are a must while he is not in the crate. He prefers all chew toys given to him, hard, soft or rawhide. Left to his own devices he may gnaw on any wooden furniture, so make sure that there are plenty of toys! He completely responds to “No”, and “sit”, so he is ready to start the training for the rest of his life. He has good energy to run and play, and then will crash for hours after. He plays equally well with kids, adults, other dogs. He has some exposure to cats, but has not yet figured out what they are. 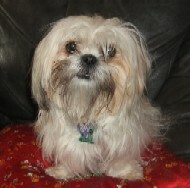 Bernadette is a beautiful full-bred white Powder puff Chinese Crested female who came to us after losing several owners. Her first owner lived out of her car and the friend who took them in kept her along with her sister in a barn. She is approximately 2 years old, weighs 15 lbs. and is a real lap dog. She will take some time to warm up in new situations but after a few days, will come sit on your lap and be your best friend. She is thriving in her foster home and happy to sit on the couch or on a lap all day long. We’re hoping for a quiet, dog-experienced home with no small children or chaos and someone who won't put her into frightening situations. City noises alarm her, so a quiet neighborhood is preferred. 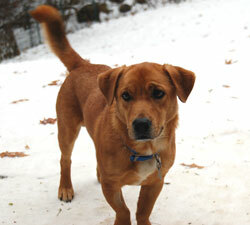 She has a lot of charm and a boatload of personality and smarts and deserves a great home. She is good with small dogs and most Crested also love cats. Please be the right match for her. She is noise-sensitive, so cannot go to a city environment where sirens would frighten her. Update: Bernadette is spayed and doing very well. She is starting to run around the back yard and play. She still hasn't discovered toys, but we know she will. 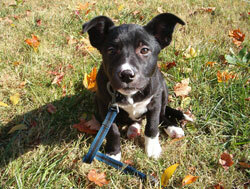 Clair is one of three Border Collie mix pups who are coming up on December 7th and will be available around the 9th. They were rescued at six weeks and have been in a foster home in TN. They are cute and playful and well adjusted, well socialized puppies as far as we can tell. They are too young to be left alone all day so a person with flex hours or part time hours is preferred. They are up to date on vaccines, wormed and flea free. They are fine with cats, good with other dogs...can be a little timid at first, but they are now with Morgan and Sunshine and play fine. 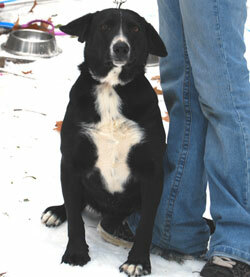 Darla is one of three Border Collie mix pups who are coming up on December 7th and will be available around the 9th. They were rescued at six weeks and have been in a foster home in TN. They are cute and playful and well adjusted, well socialized puppies as far as we can tell. They are too young to be left alone all day so a person with flex hours or part time hours is preferred. They are up to date on vaccines, wormed and flea free. They are fine with cats, good with other dogs...can be a little timid at first, but they are now with Morgan and Sunshine and play fine. Dolly is a 7-8 month old female retriever mix with many features of a Golden, except for the long hair. 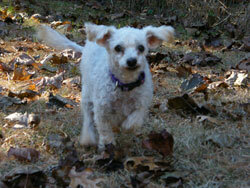 She is living with her pal, Rebel, in a foster home in TN. They are good dogs and friendly with people and other dogs....just very active. Lately they have taken to escaping and going on daily adventures because the yard is not secure, so we want to rescue them before they get hit by cars. Once we receive a few applications, we can bring them up for adoption. They will be adopted separately. She obeys some basic commands and is a really nice dog. We're not sure if she's medium or large, but we put large just to be on the safe side. Kaci is a two year old beagle who is being returned due to housetraining issues. She has pee accidents in the house and the family is too busy to put her through the training. She's on a diet which might be contributing to the problem, so we will switch her to a fresh food diet along with a check up at our vet's and crate training. She is EXCELLENT with kids, even small children and if she had a fenced in back yard to sniff around in, she would be in heaven. She would be a great dog for a family who loves the breed or who just wants a dog who is bomb proof around little ones. 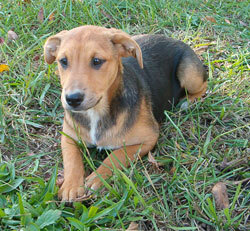 Kala is an adorable 4.5 month old Beagle/Lab Heinz 57 mix. She is a mutt mutt and just as cute and playful as can be. She is part of a litter of nine pups. We've already rescued and placed six of them. She is the sibling to Beamer and Shasta, who are with us now. Please apply online and we will be in touch shortly. She is scheduled to arrive on Dec. 7 and will be available within a few days of her arrival. She and his siblings see cats all the time and don't get excited about them, fine with other dogs it seems...always sticking their faces throught he fence to other dogs! 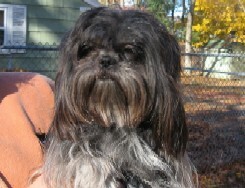 Lady Darwin, or "Darwin" for short, is an adorable 8 month old purebred shih tzu puppy. She is sweet, and playful, and loves attention and to play fetch the squeaky toy. She comes to her name and knows a few other commands like lie down. She is a typical curious puppy. Her owner had to give her up, but it's obvious that she was given alot of love and attention during her 8 months. IShe needs to be taken out often and will need some reinforcement re: housetraining; she doesnt really know how to "ask" to go out. Darwin is looking for a stay at home 0r work at home person to give her a forever home with lots of love and attention, someone who knows that she might live to be 18 yrs old and can make a long term committment to her so that she will never have to lose her family and home again. If you are interested in doing so, please fill out an application. 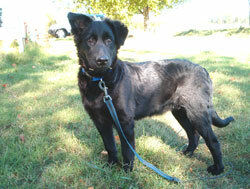 Morgan is a sweet, fluffy 6-7 month old Retriever mix. She is small and a little fluff ball so probably Sheltie or something on the smaller side. She is in a foster home in WV and will be coming up around December 8th. If you're interested in meeting her, please fill out an application on our How to Adopt page asap. She'll be snapped up quickly. She seems fine with cats, good with other dogs, good with adults and were fine around the vet's year old son....but would want to see her in different situations before saying good with all kids! She was originally found as a stray running down a four lane highway. She is great with other dogs, ignores cats, was originally fostered with a child but is currently in a foster home with no kids. She has medium energy level, is almost housebroken, and is a pretty easy keeper. She has finished her puppy shots, has her rabies, and is spayed. Neitzche is looking for someone who can give him all their time and attention, as he deserves, and will treat him like a little prince. He will need some basic obedience training, but is mostly house trained if he's taken out often. He's looking for a forever home where he will never have to lose his people and his home again. If you are that person, please fill out an application! THANK YOU! Oreo is the brother of a dog named Molly, who we just placed a few weeks ago. He is a retriever mix, probably flat-coat, 3.5 years old, neutered, utd on shots, on Interceptor, Advantage, Eagle Pack Holistic food. 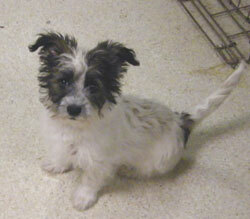 Oreo is cute, good with other dogs and people, playful. He is good on leash! 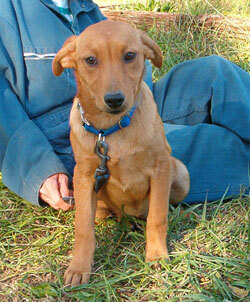 His mom was a red dachshund mix and dad a retriever mix. Oreo has med length hair and it is wavy. He is a sweet dog, will run for a ball or toy and will pick it up in his mouth and carry it around. He is available! He loves the snow! 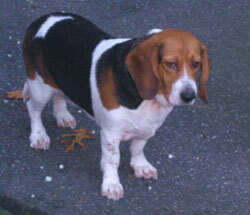 Pepper is an adorable beagle/bassett (bagel) who came to us from a rescue group in TN after being neutered. He had some complications to his neuter surgery, a hematoma, which caused him to go after his stitches, but he is recovered and doing great. His vet bill is already over $400 so while he is recovering, we're asking for a few sponsors to help us with his expenses. He is 25 lbs., full grown, short legs with a long body and cute as can be. He gets along with all the other dogs. He has the crooked legs of a Dachshund or Bassett or Corgi and a longish body. He is affectionate. He has an under-bite which is so cute. This guy deserves a great home. He is a really sweet dog. Update: Pepper is doing great now. He is healing up and his playfulness is back. He loves a stuffed animal to carry around and loves chewing on a good bone. Precious is the 13 week old pup to Sandra, the mini poodle, and Hooch, the Benji-like Terrier/Shih tzu. She is darling, smart, outgoing, mouthy, full of herself and very active. The ideal home would be someone small-dog-savvy who has the time to adore her but also train her. A stay at home or someone with flex hours would be ideal. She is not a dog for a senior or for someone who is gone most of the day and not a dog who could wait around for a school-aged child to come home and let her out. She's pint-sized with a tiny bladder and also with socialization needs, as all puppies do. Sandra is adopted! We found her a wonderful home, better than we could have dreamed of. Thank you, everyone, who sponsored her to come up here and find the opportunity of a lifetime! 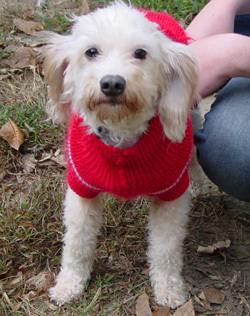 Sandra is a white and apricot poodle who is 10 years old and just had puppies. She just had a complete medical workup and is in good health so will be spayed next week. We are looking for someone who will give her the extra TLC and loving she will need for the rest of her life. We are looking for a few "rescue angels" to sponsor her medical care and spaying. We will have her spayed by our holistic vet so that she can receive the best possible care and a dental if she needs it. We are looking for a wonderful retirement home for her. She weighs 10-13 lbs and would make someone a wonderful lap dog or just a pal to hang out with. She is extremely affectionate. 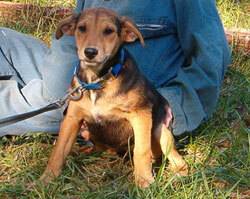 Shasta is a 18 week olf Lab/Beagle mix, but she doesn't act like a hound at all, more like a lab. She is adorablly sweet, very submissive, and playful. We can't believe we still have her. She is the perfect dog, 90% housetrained, quiet, crates well, playful, loves her stuffed toys, likes squeaking squeakies. She's not going to be very big, maybe 40 lbs. She would make the perfect addtion to any family. Please apply online as she is in a foster home so we need your information and then we can make arrangements. She can even meet you on the holiday weekend. Jenny is a one year old Border Collie mix. She is very playful, around 35#. She LOVES the snow! She is people and dog friendly and cute as can be. Don't know what she is mixed with, maybe Lab as she has the shape of an English Lab, although small. The vet thinks she is around 1 year old. She was abandoned in a county near mine (one of the top 200 poorest counties in the US and where the attitude toward animals is pretty bad). A dog lover ran a paper route in that area and saw Jenny looking for food and got her. She had mange and looked pretty awful. 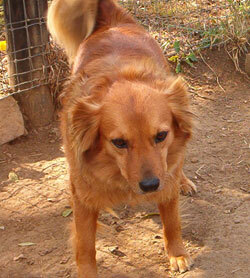 She went into rescue care and she is now healthy, has a pretty coat, is very active and playful. She is spayed, utd on everything, heartworm neg and on Interceptor. She has been cat tested and seems fine with cats.....which is surprising since her foster mom thought she would at least try to round them up like most border collies want to do! She arrives 12/8 and is available after her vet check on 12/10/07. She seems fine with cats...inside and outside..... according to her foster mom, is good with other dogs, good with adults, not exposed to kids yet, that we know of. 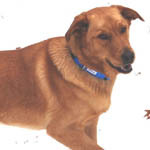 Samantha is a five year old Golden Retriever mix. She is in a foster home in TN with her two grown pups, Roscoe and Sissy. She had them when she was a year old and was spayed shortly after they were weaned. She is a gorgeous dog with a wonderful personality. She will arrive in early December, but we are reviewing applications now. Sissy is a Golden Retriever mix who we recently took in, along with her mother, Samantha, and brother, Roscoe, from a rescue home in TN. She is a beautiful dog, born May 15, 2003. She was spayed at one year and is up to date on vaccines and heartworm negative. She had one mild seizure following a vaccine when she was a year old, so she is exempt from further vaccinations. The vet said this is not uncommon and most people wouldn't even notice as it can often happen after the vet visit, when the dog is home. She is extremely healthy and completely normal. She is fully housebroken and doesn't get into stuff in the house. She's great with cats, safe as she ignores, and great with dogs too. Sissy is adorable and very sweet. Altered and utd on everything. She was on Eagle Pack Holistic in his foster home in TN. 12/15/ Update on Zelda from her foster mom: Just wanted to let you know Zelda is amazing and we are loving having her here. She is fully crate trained, not a peep out of her and she goes into the crate on her own to nap when she needs to. She is also housetrained and goes to the deck doors to be let out when she needs to. Denise has obviously done a great job with her and thought you may want to mention her housebroken and crate-trained on the website since she hasn't been adopted yet. She and Kappy are having a blast hopping in the yard in the snow and she is trying to catch all the leaves blowing down from the trees- absolute riot to watch. She is a peach in the car, content to just look out the window or snooze. No trying to jump into the front seat or any of that behavior. At bedtime, I crated her in my bedroom so she is in the same room as me and my dog, and she sleeps wonderfully through the night without a single whimper. She's a very good puppy. Zelda is an adorable 4.5 month old Beagle/Lab Heinz 57 mix. She is a mutt mutt and just as cute and playful as can be. She is part of a litter of nine pups. We've already rescued and placed six of them. She is the sibling to Beamer and Shasta, who are with us now. Please apply online and we will be in touch shortly. 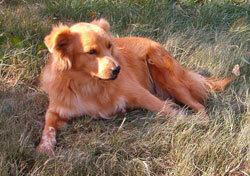 Sunshine is a beautiful female Golden mixed (we think with Brittany). 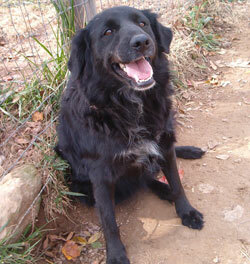 She is playful, friendly, good with people (never meets a stranger), good with other dogs, fine with cats. She is around 1 year old or less. She is a bundle of positive energy! She loves to play with kids. If someone throws a ball, she will fly through the air to catch it. She is amazing to watch. She is absolutely precious and adorable! As you can tell by looking at that face, Sunshine is a little dog with an attitude! 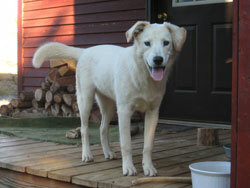 She is good with other dogs, never meets a stranger, playful, playful, playful (never still a minute). I think she is pretty as a picture! Loves to play ball...will fly through the air to catch a ball...really fun to watch and play with. Good on a leash, good in the car, partially housebroken (occasional accidents), great with kids. We're bringing her up on Dec. 8th and she will be available after her health exam on 12/10/07. Our first preference would be with a dog-experienced agility home, but if not then people who have time for a lot of ball throwing, hiking, or who have other active dogs. This is the type of dog who is so cute that everyone will want her, but unless she gets her needs met, it will be a frustrating experience. We've been through it enough to not want to make that mistake again. Please be someone who can commit to her for life. Think about your 10-15 year plan as you should with any dog.